Follow the adventures of the Griffin Dynasty and their world shaping exploits, as well as the legendary Crag Hack the barbarian and Sandro the nefarious Lich, as they make an Epic comeback to the World of Ashan. 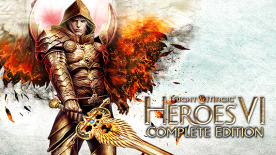 Determine the fates of 6 legendary factions, including the fan-favorite Knights of Haven, the Necromancers of Necropolis, and the Dark Elves of Dungeon, as well as the brand new faction, the Naga of Sanctuary. Experience the unique mix of Turn-Based Strategy & RPG: Explore extra-large adventure maps, collect resources and build extraordinary cities. Perfect your tactics, level-up your heroes, recruit troops & lead them to combat on tactical battle maps. Dive into the richness of the M&M Universe: Discover fantastic landscapes and creatures from the world of Ashan. Enjoy improved 3D designs and brand new Townscreens. © 2013 Ubisoft Entertainment. All Rights Reserved. Might & Magic, Heroes, Ubisoft and the Ubisoft logo are trademarks of Ubisoft Entertainment in the U.S. and/or other countries.